Searching for Arkansas Amish furniture? While not well-known for Plain people, the state does have its own small Amish settlements a few hours’ drive from Little Rock. Amish craftsmanship is well-known for its high quality. Amish produce a wide range of furniture items, including beds, tables, desks, dressers, kitchen cabinets, office furniture, and much more. Arkansans can purchase Amish furniture in outlets in neighboring Missouri and Texas, as well as at least one location in-state. Amish-made chests, nightstands, hutches, dining rooms, arm chairs, and much more. To find Amish woodworkers and furniture dealers in other states, visit the Amish Furniture Guide main listings. Note to Arkansas residents: Please be sure to check opening hours of any Amish furniture businesses listed in this guide before traveling long distances. While we strive to keep this directory up-to-date, business locations and schedules can change. Not responsible for changes to information. While there may be few Amish furniture makers in Arkansas today, Amish have a history of settlement in the state dating back to the pre-Depression era. Today Amish in Arkansas can be found in a few locations including Clay County and Fulton County near the Missouri border. Despite being perceived as a people tied to the land, Amish move quite a bit. One of the main reasons is for economic betterment. With large families and scarce land dairy farming is not a feasible option for all Amish. 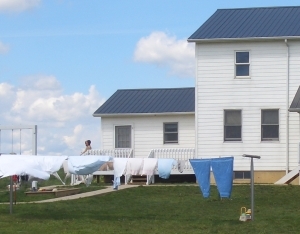 Small businesses such as furniture shops allow Amish to stay at home and work with family, similar to the farm. In recent decades, small furniture enterprise has become one of the primary occupations for Amish people. Furniture-making is attractive to Amish because it doesn’t require a huge investment compared to the large capital outlay of a farm. Amish communities such as those at Ethridge, Tennessee and Munfordville, Kentucky feature a number of thriving furniture producers. Amish furniture comes in a range of styles, from the contemporary to the traditional. Amish furniture is typically made from solid wood rather than particle board or pressed wood. Amish use a range of woods including cherry, walnut, oak, hickory, and maple. Amish finishing shops complete the piece by adding an attractive stain. Amish produce everything from gazebos to children’s furniture to entertainment centers. Many also do custom work, which can be arranged either direct with the Amish craftsman or with a non-Amish furniture dealer. Bedrooms, office suites, hickory rockers, stools, kitchen accessories, and other items are among the many other pieces crafted in Amish shops. The Amish population in Arkansas is small. Will Amish continue to settle the state, and will Arkansas Amish communities continue to grow? The furniture industry is one key to the Amish moving forward. Furniture-making remains an attractive option for Amish in AR and elsewhere. Arkansas residents looking for high-quality home furnishings have a range of options for purchasing Amish furniture, including direct from showrooms throughout the region as well as from online Amish furniture sellers.